It’s National School Breakfast Week! 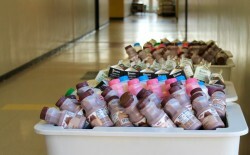 This week we are spotlighting schools that are using alternative methods in order to feed more kids breakfast at school! The Colonial School District is working hard to ensure that each and every student has access to a nutritious school breakfast. To help increase the number of students eating breakfast at school, the district has implemented several out-of-the-box alternatives. So far they have been a success. At Gunning Bedford Middle School, where all students receive free breakfast, more than 700 students eat breakfast at school each day. Thanks to four Grab and Go kiosks, grabbing breakfast and heading to the classroom is as easy as 1-2-3. 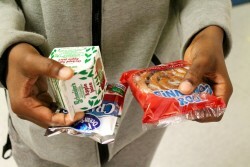 Prior to Grab and Go, students were required to eat breakfast in the cafeteria. “We were struggling to serve over 200 meals when breakfast was in the cafeteria,” said Gunning Bedford’s cafeteria manager Lisa Thompson. 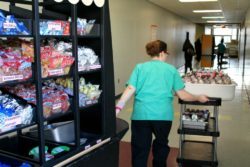 Since the switch, Gunning Bedford’s nutrition services department has tripled the number of breakfasts served. 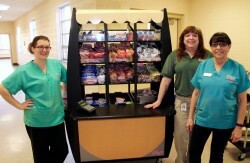 Four kiosks on wheels are stocked by the nutrition team each morning. 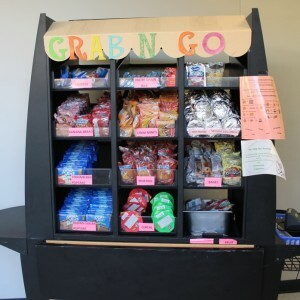 Students have options such as hot breakfast sandwiches, bagels, muffins, Poptarts, cereal, yogurt, Nutrigrain bars, fruit, juice, milk and more. 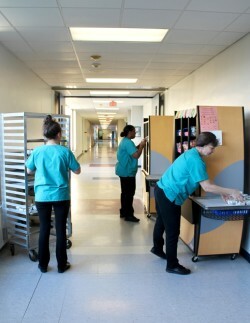 Once stocked, cafeteria staff roll the kiosks to designated areas of the school where students pick their items and head back to the classroom. 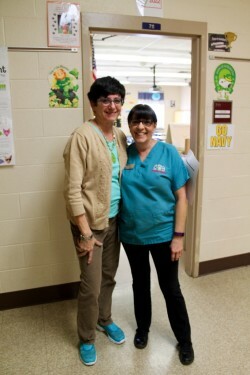 Tammy Roop, Operations Manager for the Colonial School District says that the district’s breakfast procedures are customized to each individual school based on building layout. Because of the school layout at Gunning Bedford, sixth and seventh graders get off the bus and head to their homeroom. If they’re interested in breakfast they receive a pink card. 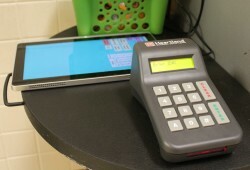 They take the card to their grade’s kiosk, get their breakfast and head back to the classroom. Tablets are used to keep track of the number of meals served. Eighth graders get off their buses and head right to their designated kiosk. 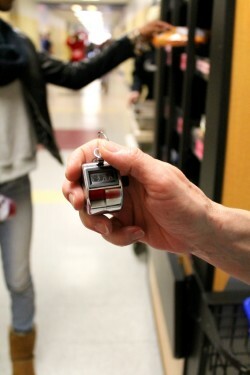 Cafeteria staff count the number of meals using a clicker. Back in the classroom, students check off their name on a roster to help keep track of meals served. Teachers also monitor the process to ensure that it is quick and efficient. It takes less than 10 minutes for students to line up at the kiosk, grab their breakfast and head back to class. Some students help push the kiosks back to the cafeteria before heading to class. Trash in the hallways or classrooms is not an issue at Gunning Bedford. 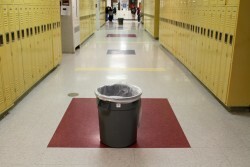 Trashcans are strategically placed down each hallway for easy trash removal. “Our teachers agree that this model is better than breakfast in the cafeteria,” said Roop. Most importantly, kids are starting the day off with a nutritious breakfast enabling them to focus in the classroom. According to research from Share Our Strength and Deloitte, students who eat school breakfast attend, on average, 1.5 more days of school per year and score 17.5 percent higher on standardized math tests. 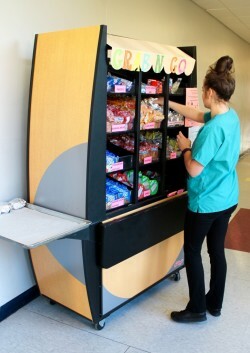 Gunning Bedford Middle School uses a Grab and Go model to serve breakfast. 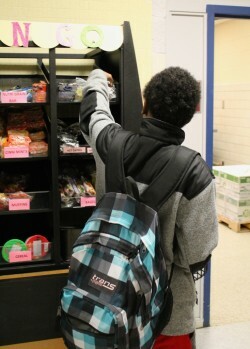 Kiosks are set up in hallways and student choose their breakfast items.